There is nothing more exciting for digital marketers than to be able to track where viewers' eyes go to on their websites and ads, to help them improve their web design and increase conversion rates. Knowing what consumers look at is the first step to ensure marketing effectiveness. Eye-tracking software allows marketers and sales teams to monitor consumers' spontaneous responses to ads and measures their attention helps to minimize errors and cover the areas that marketing research tends to miss. There are plenty of marketing results to be learned from heat maps generated by such software. The image from eye-tracking software below shows the problem with ad banners, to which people seem to have developed a selective blindness. 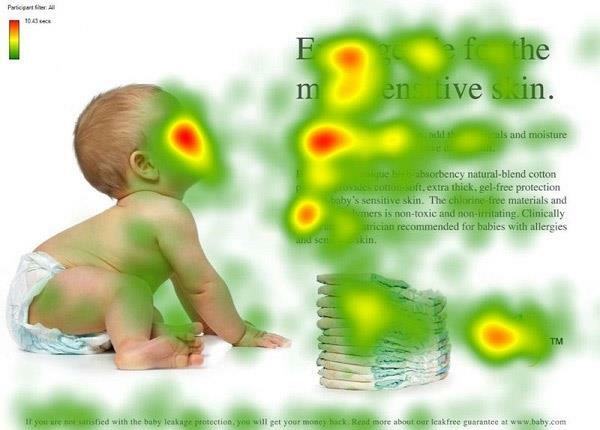 Notice from the heat map below that eyes don't go to the banner ads at all, so it ties up with research data that suggests 86% consumers spontaneously ignore banner ads. Clearly, there is no need to spend valuable marketing budgets on these ads. The heat map below shows that the top five listings on Google get most of the eyeballs. All the rest are ignored. This should suggest the importance of getting your website for top keywords right at the top of the page. It's no surprise that videos draw the eyes of consumers more than any other type of content. The image below shows that on search result pages, while the top 3 results do get most of the eyeballs, so do videos even when they are not the number 1 result. This includes both direct video results, such as the ones hosted on YouTube as well as videos that are embedded in web pages. YouTube videos have the additional advantage of being a part of one of Google's own services, so it's always a good idea, if you want a higher SERP ranking, to have some videos up on YouTube to improve brand visibility. The question is why is video more effective than product pages, when targeting consumers who are looking for a particular product? The answer to that might be Google Authorship's impact on search traffic. Authorship photos could play a role in suggesting to visitors that a page is not a product page but a blog post or an article. Videos, however, are usually automatically assumed to be product videos and will very likely have higher click-through. It's always better to test this to see if it affects your SERP positions for top keywords, rather than accepting the general consensus on it. This tip will apply to online grocery stores and other consumable goods marketers who are trying to market certain products. The heat map below suggests that people shopping for groceries are looking at prices on image ads, and this could tell you a lot about how to design the ad blocks on your website. 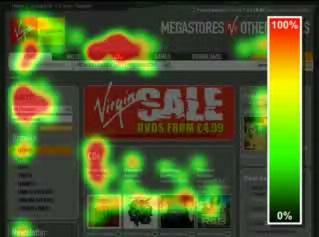 An interesting evidence of consumer behavior that eye-tracking software heat maps have given is that directional cues and visual cues to point visitors in the direction you want them to look are very effective. For instance, in the image below, people follow the baby's eyes to look at the words to its right. When you compare the image above with the image below, in which the baby is looking straight at the viewer, you can see that there are fewer eyes on the text to the right. There have been many other studies to support this evidence, such as the Eye Gaze Cannot Be Ignored, published at PubMed.gov. People have a natural tendency to follow the direction in which others are looking, just as we've learned from a young age to follow arrows out of our natural sense of curiosity. It's also a known fact that the faces of pretty women and babies draw the most attention from viewers. Put these two known facts together, and you have a valuable piece of information about how to design your online ads and web pages. These are only a few tips on how eye-tracking software can be used to effectively design adverts, web pages and other sales tools. These tips could be applied to online marketing, print marketing, other visual media, as well as mobile marketing, since mobiles are a prominent way of reaching out to a large section of smartphone-savvy customers today.